After your baby is born there are several procedures, screenings and tests performed to ensure your baby’s health and safety. Choosing a pediatric provider before your baby is born is important. This may allow the provider to see your baby during the hospital stay. You may also request to meet with the provider before your baby’s birth. If your provider does not come to Hartford Hospital, the hospital pediatric providers or covering pediatricians will see your baby. For a list of pediatric providers who see patients at Hartford Hospital, click here, or call the Hartford Hospital Health Referral Center at 860.545.1888 (toll-free 1.800.545.7664). After your baby is born two sets of footprints will be taken of your baby. These will be placed in your baby’s chart and one set will be given to you before you go home. As soon as your baby is born, identification bands will be put on the baby and mother. Another band is available for fathers or other support persons identified by the mother. DO NOT REMOVE THESE BANDS BEFORE YOUR BABY GOES HOME. YOU CANNOT ENTER THE NURSERY OR TAKE YOUR BABY TO YOUR ROOM WITHOUT THESE BANDS IN PLACE. SPECIAL NOTE: For the safety and security of your baby, we ask that when walking in the hallways, you keep your baby in the bassinet. In order to measure the level of jaundice (yellow pigment) in your baby’s skin, a monitor is placed on your baby’s forehead for a few seconds. This gives a reading, and if high, a blood test for bilirubin is done. Some jaundice is normal but a high level can be harmful. Given in your baby’s thigh muscle in the first 4 hours of life, this protects against a bleeding disorder in the first weeks of life until your baby can make his/her own vitamin K.
For babies born at less than 37 weeks of pregnancy, your baby’s breathing and oxygen will be monitored in your infant car seat for one hour. This will check to see if it is safe to put your baby in the infant seat for the ride home. If this test is required you will need to bring your infant car seat to the hospital a day prior to going home so that the test can be done. This is a non-invasive test for early detection of hearing loss. It takes about 5 minutes. If your baby does not pass the test, a referral will be made for further testing after discharge. Within 24 hours after birth a small amount of blood is taken from your baby’s heel. It is sent to the State Laboratory to screen for multiple rare metabolic disorders. Your baby’s provider will be notified of an abnormal result. This is applied to both baby’s eyes in the first hour after birth and protects against a serious eye infection. This screening is recommended for all newborns with parental consent. Cystic Fibrosis is an inherited disease affecting a child’s mucus and sweat glands. Early diagnosis can improve care and quality of life. A small amount of blood is sent to the University of Connecticut Laboratory (860.679.4439) and is tested for a protein (IRT) that is increased in cystic fibrosis. A DNA test is also done on the same blood. If this is abnormal, your provider will be notified and will refer your baby for a sweat test. Breastfeed to give your baby the best start in life and natural protection against common infections. If you cannot breastfeed, ask about safe alternatives. 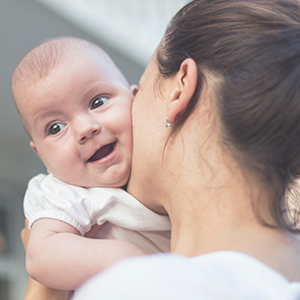 Room-in together so you can respond to your baby’s cues and feel more comfortable caring for your baby before you go home. Studies show that mothers do not actually get more rest if babies are in the nursery. Please do not sleep with your baby in your bed or chair. Babies have fallen out of parents’ arms to the floor when a parent has fallen asleep. Place your baby on his or her back to sleep. This decreases the risk of sudden infant death. Never shake a baby! Ask about ways to calm a crying baby and cope with crying. Ensure a safe ride home in an approved infant car seat placed in the back seat facing the rear. Ensure that your infant car seat is installed correctly (call 211 for testing sites) or visit ctsafekids.org. Rest as much as possible – arrange for help in the first few weeks. Please Note: If you should experience any pain or bleeding, or believe that there is something wrong with your pregnancy, call your health care provider immediately, go to your hospital's emergency room, or dial 911 for help. It is very important to choose your baby’s doctor before coming to the hospital to deliver your baby.